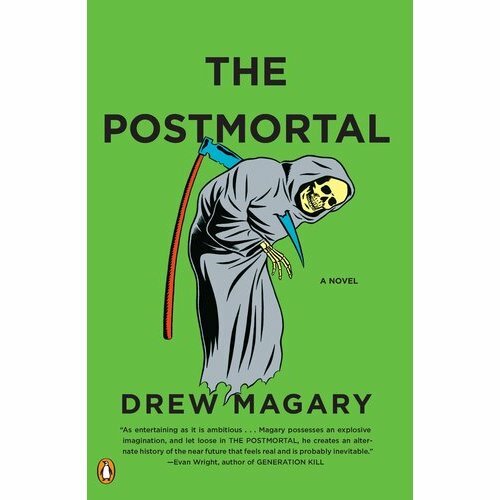 Deadspin writer Drew Magary’s new novel, The Postmortal, gives us one of many responses to the question, “what if we could all live forever?” Magary’s world without natural death is considerably grim, with cues taken heavily from the resource-hungry world of P.D. James’ The Children of Men. Narrator John Farrell is a nice guy, if not a bit of a loner. He’s somewhat of an upper-middle class everyman, an estate and divorce lawyer that just happens to have taken The Cure to aging for no particular reason. He has a roommate, he drinks too much, and he goes to visit his aging dad out in Connecticut. It’s nice that a normal guy is the one leading us down the rabbit hole, and not a preternaturally handsome and strong hero with big muscles and an even bigger gun. But once John chooses that ubiquitous red pill, his world is anything but normal. The book is quick, full of action, real Brett Ratner-type explosions and terrorist attacks. The Postmortal is unlike so much new fiction because things happen. In fact, a million things happen, each page packed to the brim with either firsthand or excerpted accounts of a rapidly deteriorating world. The change is refreshing, considering that many of the books I’ve read in the past year feature no action more exciting than a bad one night stand or a bout of particularly profound thoughts. In that way, Magary is more like cyberpunk maestro William Gibson, who wrote stunning novels that could stand on plot alone. If Gibson somehow wrote something that was kind of crappy, we’d still read it, because his stories never disappoint. Magary’s triumph in The Postmortal is not in his cadence or tone–the writing itself is fairly unremarkable–but in the overwhelming detail he uses to draw us into John’s life. This book isn’t for reading slowly; instead, it is to be devoured in one sitting, driven by the need to know what happens next. And what happens next is always worse than the thing that happened previously. The Postmortal isn’t afraid to be dark, with short chapters that become exponentially more terrifying as the novel progresses. Just when you think John will get a break, he gets kicked in the nuts. It’s tiring, but when faced with Magary’s moral quandary, it also rings true. There is no upside to this world, and there will be no redemption for John or any of his fellow Postmortals. The Cure is the apple given to Eve by the snake, intimated by the novel’s brief, ominous introduction. I recommend reading that part again once you finish the book. Of course, I can’t neglect to mention that reading The Postmortal is instinctively accompanied by a phantom soundtrack, that driving, pounding score you remember from disaster movies like The Day After Tomorrow and Independence Day. The novel is screaming to be adapted for the screen, and I keep myself up at night trying to think who they’d cast to play John. The action plays out so vividly that it is hard not to see Hollywood actors in every scene, all fighting for the juicy lead role in what could very well be next summer’s big blockbuster success.